Whilst summer is well and truly here, as always, I seem to cast my iced water aside to replace with something cold and sweet. I can’t help it and with this burden need I find myself in search of the best flavoured ice creams to help cool me down. Whilst visiting Florida a few months back, I took this opportunity to try out a few different styles of ice cream sandwich, having fallen in love with the concept whilst sampling a Ben & Jerry’s ‘wich many years ago. The Americans seem to have the ice cream ‘wich a little more sorted than we do here in the UK, but I still wasn’t as fulfilled as I’d hoped to have been. Two of the three I sampled out there didn’t taste of too much, very plain, refreshing, but didn’t deliver on tastiness. On returning home, I visited an ice cream stand at my local Eat:Cambridge food festival where I met two ice cream-loving fanatics at their stand. They had made a peanut & pretzel cookie sandwich with salted caramel ice cream and I was easily suckered in for a nibble – this worked so well with homemade cookies, making me wish I could make good quality cookies myself. I’ve tried for years and to be completely honest, lately, I’ve not been baking much due to a lack of time, so I’m all for a quick hack where possible when it comes to a sweet fix. So, the challenge was set, once home and with the weather warming up, I decided to start making my own homemade ice cream sandwiches, with some cheating a little help from my local supermarket. 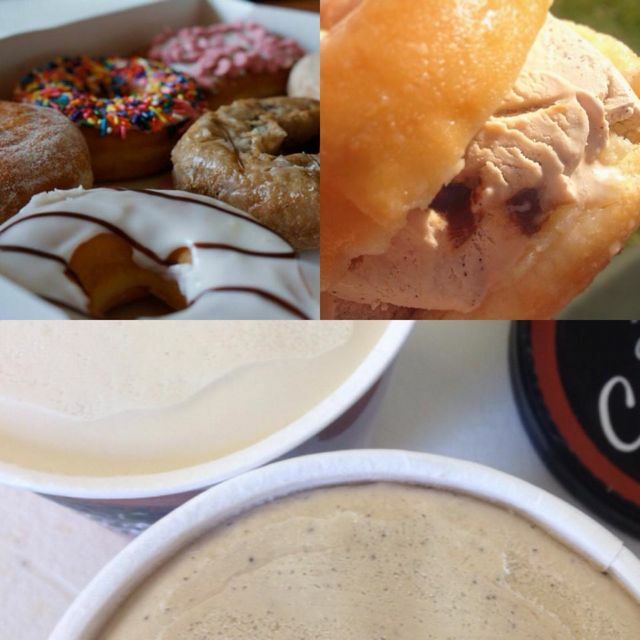 After a good old search on Pinterest – I’ve created a Pinterest board here for research – I tried out a few different ideas, one being the doughnut ice cream sandwich. Yep, that’s right… A glazed ring doughnut, sliced into two, filled with your chosen flavoured scoops, sandwiched together and popped back into the freezer to toughen… and then enjoy, phew! 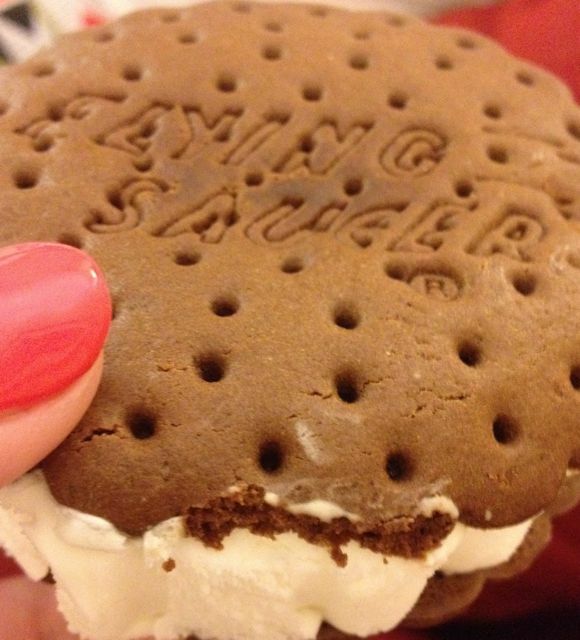 Follow MissSueFlay’s board Ice Cream Sandwich on Pinterest. Even for me these were far too sweet. Shocking, I know. So, next I tried with supermarket cookies. 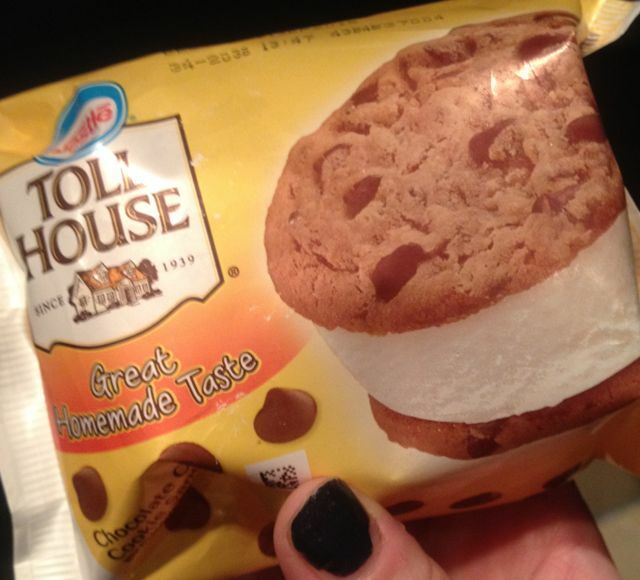 You know the ones, they are in the fresh bakery aisle, the size of your palm and flat enough to use two as the “sandwich” in your new ice cream addiction. I’ve enjoyed playing around with Rolo (toffee & chocolate) flavoured cookies, oat & raisin, chocolate chip and even orange Jaffa cookies. The Jaffa being my ultimate favourite cookie, I’m just in need of the perfect filling to match it – ideas on a postcard! The ice cream? 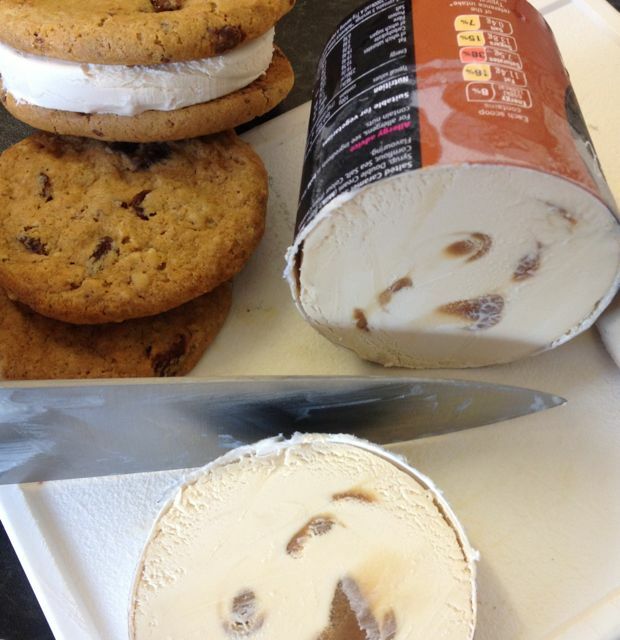 I’ve been using Tesco Finest own brand ice cream, surprising, even for me. These were on offer whilst shopping at one of very few shops in my second home within deepest, darkest Norfolk, so I went for their 2 for £5 deal. They come in card tubs, just like the Ben & Jerry’s or equivalent would come in and do you know what?… They have super strong tastes of the flavours we bought and are truly quite delicious, I was pleasantly surprised. My favourite flavours are the Salted Caramel and Caffe Latte, both with huge dollops of a flavoured sauce swirled within this creamy flavoured ice cream. The coffee hit is fantastic with this brand, working perfectly with a chocolate chip or double chocolate cookie. The salted caramel gives you a proper salt kick (some salted caramels you can hardly taste the salt) and it is the perfect cheeky filling for a Jaffa orange cookie combo. In fact, I might go as far as stating that I prefer these to their more expensive rivals – controversial eh? So far, I’ve learnt that scooping and then filling is a very messy endeavour…. And so, I teach you a mess-free hack that you’ll thank me for once you’ve tried it. 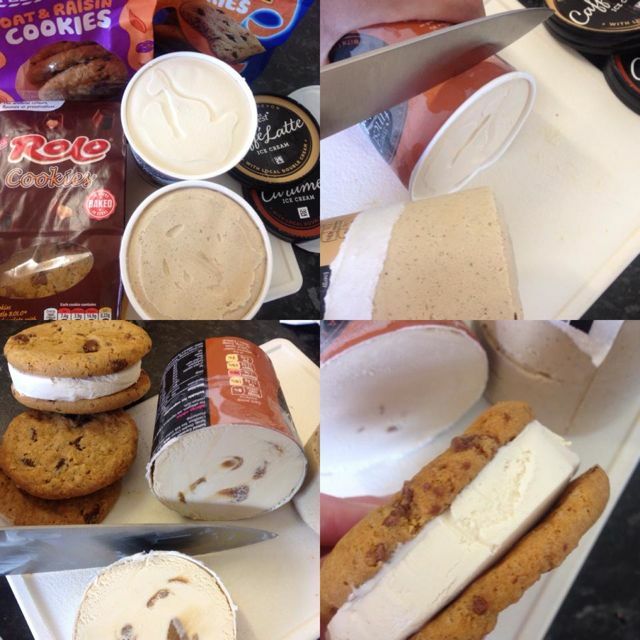 Yep, peel the tub away for your frozen block of ice cream, slice 2cm thick wedges (or thicker if you want it deep-filled) with a slightly warmed knife (under warm water for a few secs will do) to pop into the middle of your sandwich and hey presto, you have a perfectly proportioned ice cream sandwich filling. No mess from scooping and melting ice cream, you get a nice clean cut all the way around. 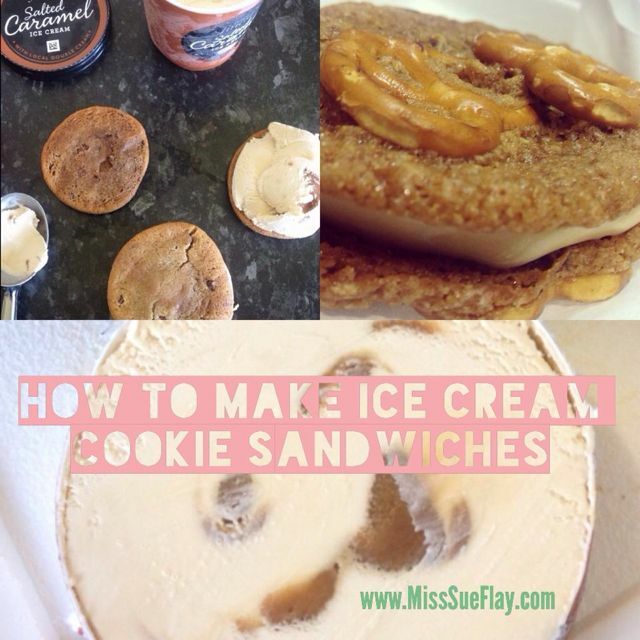 I then wrap my sandwiches in foil or baking parchment, label them up with the flavour of ice cream and cookie combo (if making up more than one type at a time) then pop them into freezer until required. The cookie hardens a little, but take out when you’re ready for a munch, leave to soften for 5 or 10 minutes and you’ll have the perfect (and quick) ice cream cookie sandwich. Have you made these yourself? How do you make them? 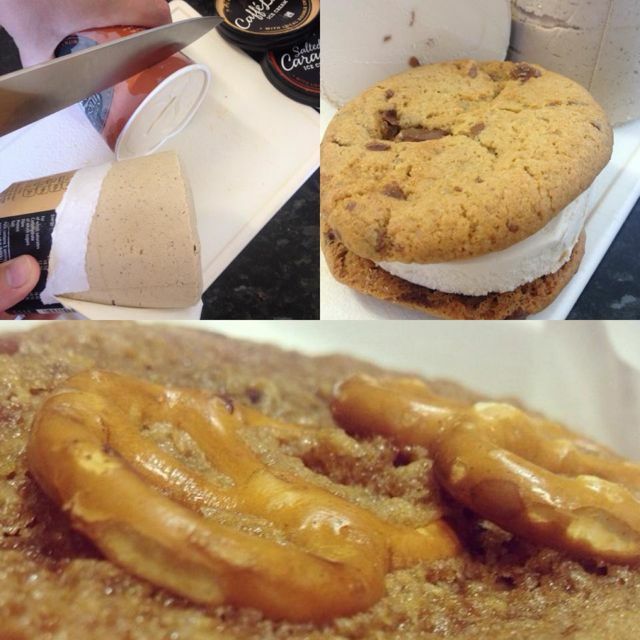 What cookie / flavour combos do you prefer?